Paul and Julia Frost, of Garway Lodge Guest House announced that on the 19th May 2015 they have been recognised as a TripAdvisor® Certificate of Excellence Hall of Fame winner. 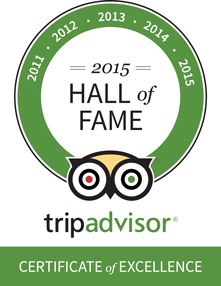 On behalf of all of us at TripAdvisor, I'm very pleased to welcome Garway Lodge to the Certificate of Excellence Hall of Fame. This unique accolade is granted only to those businesses that have won the Certificate of Excellence for five years in a row. “Being awarded the TripAdvisor Certificate of Excellence five years in a row and inducted into the ‘Hall of Fame’ is a true source of pride for us at Garway Lodge. 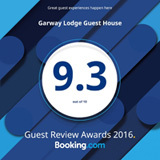 “We have had many wonderful guests who make it a pleasure to work with them, and to make their stay exceptional”, commented owners Paul and Julia, “Our mission since we assumed ownership of Garway Lodge has always been making our guests feel at home, and as comfortable as possible”, said Paul and Julia. “There is no greater seal of approval than being recognised by one’s customers. With the TripAdvisor Certificate of Excellence based on customer reviews, the accolade is a remarkable vote of confidence to our business and our continued commitment to excellence. We would also like to give special thanks to the many excellent vendors and suppliers who have been so willing to work with us to help create memories for our guests. But most of all we give our thanks to our exceptional guests and their gracious comments. Thanks everyone! Garway Lodge is an Adults Only Licenced Guest House, has all en-suite rooms which comprise of single, double or twin/king-size beds, in the heart of Torquay, but far enough from the harbour to have a peaceful night away from the nightlife, We are a 10 minute walk to Abbey Sands seafront. When selecting Certificate of Excellence winners, TripAdvisor uses a proprietary algorithm to determine the honorees that take into account the quality, quantity and recency of reviews and opinions submitted by travelers on TripAdvisor over a 12-month period as well as business’s tenure and ranking on the Popularity Index on the site. To qualify, a business must maintain an overall TripAdvisor bubble rating of at least four out of five, have a minimum number of reviews and must have been listed on TripAdvisor for at least 12 months.